Feline distemper or feline panleukopenia is a highly contagious viral disease of kittens and adult cats caused by the feline parvovirus. It is also called panleukopenia as it affects the bone marrow and causes low white blood cell counts. It is relatively common in unvaccinated cats and is often fatal, especially in young kittens. It has been referred to as Feline Distemper, but in fact, it is a different virus than canine distemper and causes different symptoms. Early symptoms of feline distemper infection are lethargy and loss of appetite then rapid progression to severe, sometimes bloody diarrhea and vomiting. These signs are very similar to other diseases, some serious, some not so serious. Therefore, if any abnormal behaviors or signs of illness are observed, it is important to have your veterinarian examine your pet as soon as possible. A diagnosis of distemper is presumed if vomiting and diarrhea are present along with a low white blood cell count. A diagnosis of distemper is confirmed when the virus is detected in blood or feces. Another syndrome associated with the feline distemper virus occurs when a susceptible pregnant cat or a newborn kitten is exposed. The kittens will have permanent damage to the cerebellum part of the brain and walk with an uncoordinated gait and an elevated tail. It may also affect the retinas of their eyes. They are otherwise alert and act normal. Infection occurs when unvaccinated cats come in contact with the virus, which may be by contact with blood, urine, feces, nasal secretions, or even the fleas from an infected cat. The hands and clothing of people who handle infected cats can also spread the disease. Unfortunately, the virus is very resistant to environmental conditions and difficult to destroy; it can remain infective for years. Routine household disinfectants will not kill the virus, and a 1 to 30 dilution of bleach should be used to clean any appropriate surfaces. There is no medication to kill the virus. Hospitalization with IV fluid therapy and antibiotics to prevent secondary infection are necessary to support the cat's health while its own body is fighting the infection. Not all will survive. 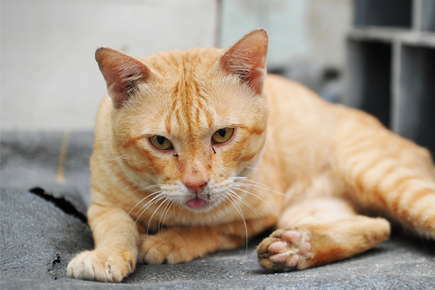 Preventing the infection through vaccination is better rather than treating an infected cat. Today's vaccines are very effective in helping your pet protect itself from infection. A series of kitten vaccinations followed by adult boosters stimulate the cat's immune system to produce protective antibodies. Should the cat come into contact with the virus, these same antibodies will help your cat successfully fight off the infection. Consult with your veterinarian for advice on a vaccination schedule appropriate for your pet.